Click above to see a short video clip of Kangaroos hopping across the road on the day of our ride from the Grampians to Horsham. Click above for a short video clip taken while I was Cycling along to the sound of schreeching Cockatoos. Taken on a back road on a ride from Loch Sport to Traralgon. Tuesday 13 March. Singapore to Bognor Regis. 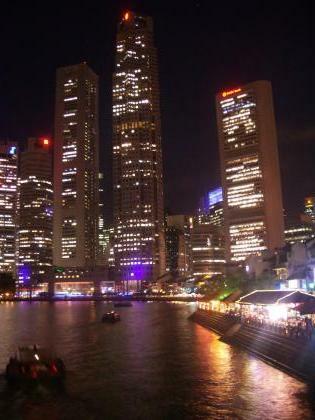 Weather in Singapore today was overcast with some light rain due later and temperatures up to 29C. I seem to have timed my return home quite well with dry sunny weather forecast back home for the rest of the week. The flight back was at a civilised time of 12.40pm. After a good buffet breakfast at the hotel I checked out and got a taxi to the Airport and collected the bike from left luggage. The fight left close to on time and was far from full so I swapped seats and got a row to myself. The plane flew north along the Malaysian Peninsula gradually leaving grey skies behind and I was able to get some shots as we flew over Penang. 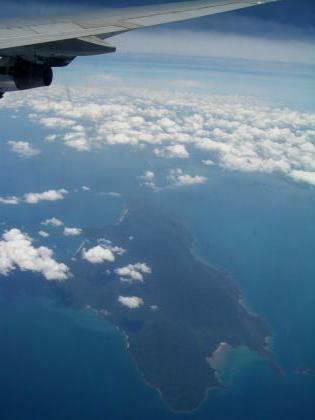 The flight continued with clear skies over the Straits of Malacca and Bay of Bengal. Then over the dry plains of northern India and great clear views of the Himalayas. 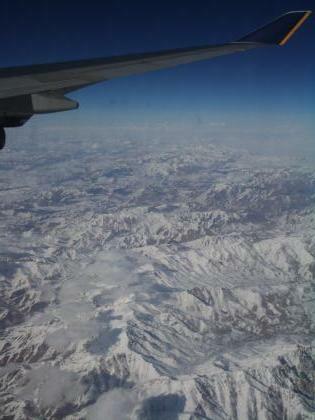 Then across Afganistan and Europe to Heathrow on a 12 1/2 hour flight. As the plane chased the setting Sun Tuesday ended up lasting 32 hours! Next some facts and impressions. Over the 8 weeks in Australia I cycled 2291 miles or approx. 3600 Kilometres. The feet of climbing was 64,422 or equal to cycling more than twice up Everest! Over the 2 months I took 39 rolls of 36 slides (1404) I also took 4690 digital pictures taken at medium resolution and spread over 4 memory cards totalling 4 1/2 Gigabytes. I found cycling in Australia to be very enjoyable helped by consistent high temperatures and an escape from the English winter. The people in Australia were always very friendly. It was a refreshing change to have car drivers in country areas wave in greeting rather than be yelled at by yobs as happens too often in the UK now. The food and accommodation were very good. The trip was really made by the frequent wildlife sightings and by everything from mammals to birds to trees being so different. The only things not to like were Road Trains and bush flies, both pests to the cyclist and of course headwinds of which we had more than our fair share. Although it is always nice to come home I am also sorry the trip is ending and would certainly like to return sometime. Weather today was sunny in the morning with more cloud around in the afternoon. Temperatures reached a humid 33C. 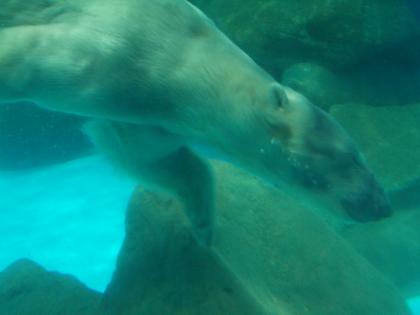 Today was really a mooching around day as I was not keen on any more serious tourist activity. 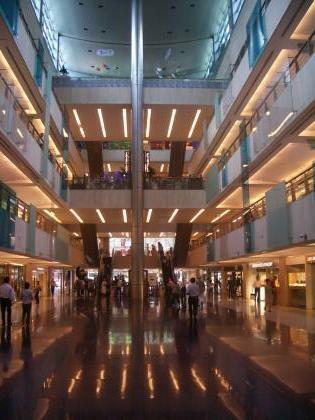 From the Hotel a lot of walking can be done in multi level air conditioned shopping malls with routes under the roads. I headed over to the nearest MRT (underground) station and took a train to Orchard Road the Oxford Street of Singapore which I had not looked at on my last visit. The inside of some of the many layered Shopping Malls had some photographic appeal and I visited a book shop and Internet Cafe. I returned via Raffles Square Station the heart of Downtown and walked back from there.. Then on to the hotel pool for a swim and last chance at some sunbathing for a little while. After dinner on the Esplanade near the Hotel I walked into the Downtown area along the River Bank and took some evening shots of the City. Weather today was sunny most of the time with a little more cloud early afternoon and temperatures reached a humid 33C. I had decided to treat myself to some 5 Star luxury for my 3 night stay in Singapore. 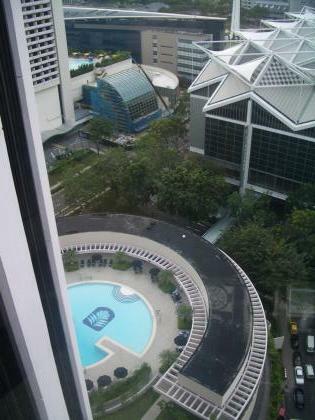 The hotel is the Pan Pacific located in Suntec City close to the centre. For all of the 37 floors the rooms are arranged around a huge internal Atrium space with external glassed elevators inside the Atrium. 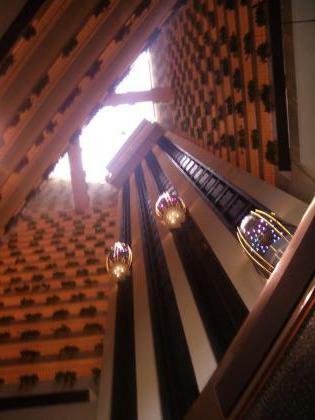 See the picture below looking up from the lobby. With a good exchange rate and deal with the Hotel the cost only worked out at 60 pounds per night. 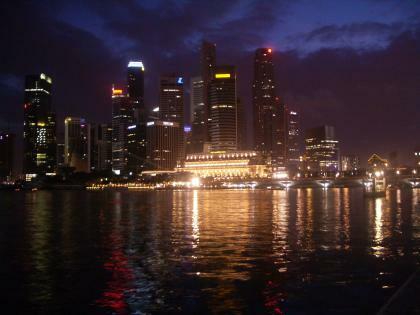 I had visited Singapore a couple of years ago and did the main sights then. 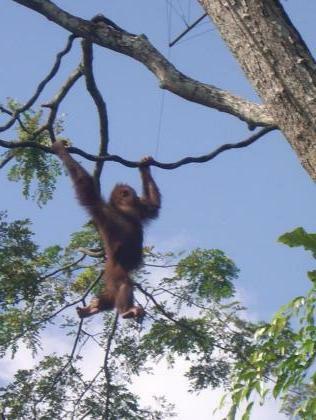 Today I decided on a visit to the renowned Singapore Zoo on the northern outskirts of the City. I took a taxi which at only 6 pounds was a lot more convenient than underground and then bus. After returning to the Hotel I took a look round a massive IT Exhibition at the Convention Centre next to the Hotel. Unfortunately tens of thousands of other technophiles or bargain hunters had the same idea. After dinner I took a walk down to the Marine esplanade for some night shots of the City Skyline. Saturday 10 March. Melbourne to Singapore. Weather today was bright blue skies all day with temperatures rising to 30C. My flight was at 5.00 p.m. but I wanted to get the bike checked in as early as possible so aimed to leave for the Airport at 1.00 p.m..
After sorting out luggage I had time for a few more hours in Melbourne taking the tram again into the centre. I did some shopping and even managed to find a 2 week old copy of Cycling Weekly for the flight. 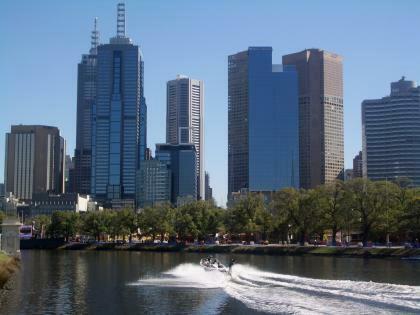 I took a few more pictures at the Riverside and watched a water-ski championship being held on the River with the City skyline in the background. Then back to the hotel and I ordered a maxitaxi to get myself and bike to the Airport. I had the card from when we first arrived and got the same driver. The flight left on time and with some seats untaken at the back I got a row to myself. With clear skies and an early evening flight as the plane chased the setting sun I got in some pictures. I looked out for areas we had cycled across and spotted the snaking bends of the Murray River we had encountered so much in our travels. 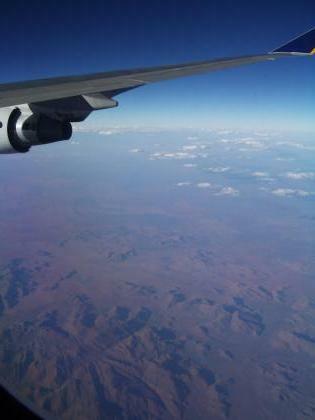 We flew over the vast arid interior of Australia and on NW to Singapore. When I arrived in Singapore everything went with great precision. The plane arrived half an hour early. Bike and luggage arrived at the luggage hall soon after I did. I was quickly able to leave the bike at the Airport left luggage and get a taxi to my Singapore Hotel. I was checked in and in the room an hour and 20 minutes after landing. If only all travel went so well! Saturday 10 March. 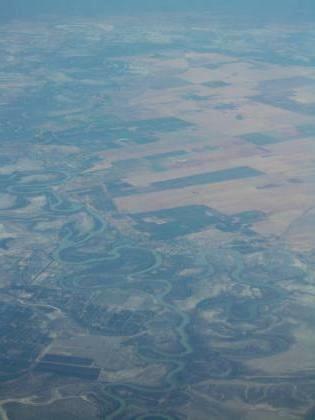 Flying over the desert interior.